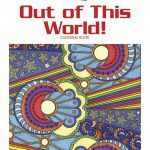 Go on a coloring adventure through space! The galatic theme includes views from the ground as well as up close with the planets. 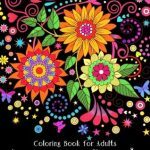 The artist has used a wild imagination to make this a fun and detailed coloring book suitable for all ages. 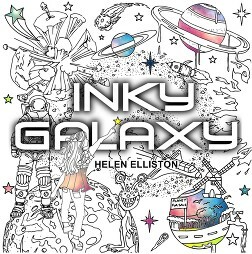 Inky Galaxy may only be a small coloring book but it packs a punch when it comes to imagery. 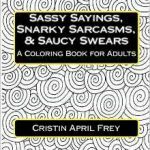 As the title suggests, the book recreates a galactic coloring adventure. You will find the typical images of stars, planets and astronauts but also a lot of quirky images. I love the girl holding a giant ice cream cone with scoops that look like planets! This is a small book measuring in at approximately 21.5cm x 21.5cm (approximately 8.5in x 8.5in). The soft matte cover shows a partially colored image on the front. This is a collage of images from the book. The back cover of the book is stunning! It features four colored drawings from within the book (including that icecream cone image!). I believe that the artist colored these herself. The artist has tutorials on her Facebook page for coloring. If you love vibrant images, with blending and effects and want to achieve that look yourself, it would be worth checking the artist’s Facebook page for her tutorials. The illustrations have been printed on white, trade stock paper, with one image per page. This image reminds me of Superwoman – breaking through the planet! 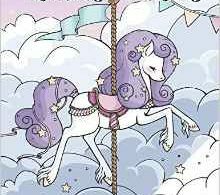 There are 46 illustrations in Inky Galaxy. Two of the illustrations have a pre-printed black background on them. The art work throughout is consistent with the theme of the book throughout. The bulk of the illustrations depict detailed scenes of a galactic nature from the perspectives of being in space, traveling within space to those viewing and imagining space from earth. We always think that astronaut’s head gear looks like a fish bowl …now it is! There are cute aliens, astronauts and people in the book interspersed with technology, planets and quirky scenes. There are three illustrations that are more simplified that the bulk of the imagery. Presumably these images of planets, stars and a mandala have been added to offer variety to the colorist. The line work is crisp and black throughout the book. The artist has used a fine to medium line weight throughout. The line art is very easy to see visually throughout the book. Small dots have been used in some of the images to give the sense of motion and movement. All of the illustrations have been well centered on the page of the book. A small allowance has been made around the edge of each image ensuring an adequate margin. This means that the images do not abut the spine, ensuring that the images are easy to color. This attention to layout makes it easy to color all the images in the book, especially the tricky area near the spine. The book lays down flat easily with some gentle prodding. 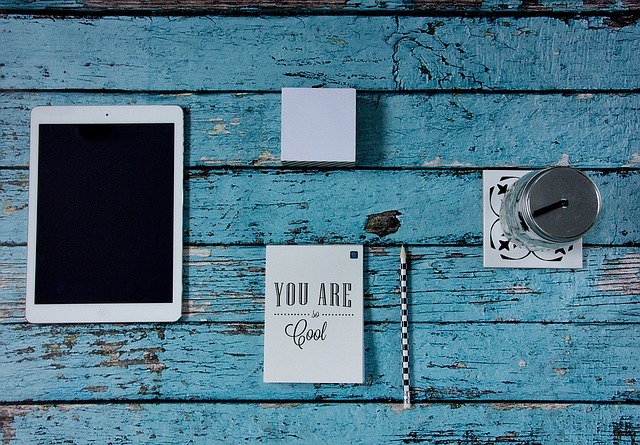 There are three images that have a fine border around them which nicely frames each picture. I would have loved to see this border on all the images. A border always, in my opinion, makes a lovey finish when there are elements that are not all contained within the page. The majority of the images have a lot of detail in them, both in the main subject and the background. 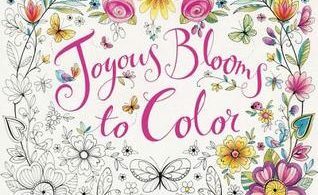 There are about 10 images in the book that have larger spaces for ease of coloring. 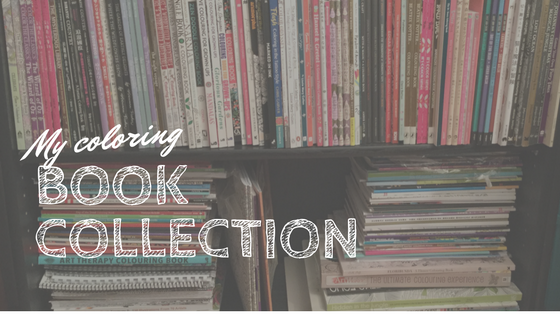 This is the type of book that would inspire some beautiful colored backgrounds using pan pastels or even eyeshadow to achieve that cool, outer space look. 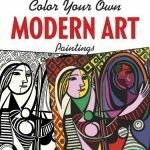 The artist has colored some eye popping backgrounds that you can see on the back cover of the book to inspire you or at her website. 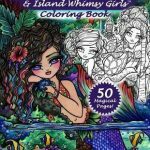 I would really encourage you to visit her Facebook page as she has posted some beautiful colorings there that really show how you can bring the line art to life. 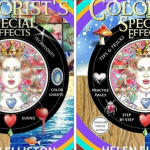 Helen Elliston is an author of romantic fiction and also an artist and illustrator. She lives in Devon in the UK. 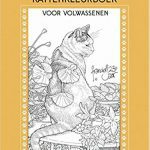 Helen has produced numerous coloring books for adults in an “Inky” series with each book having a different theme.